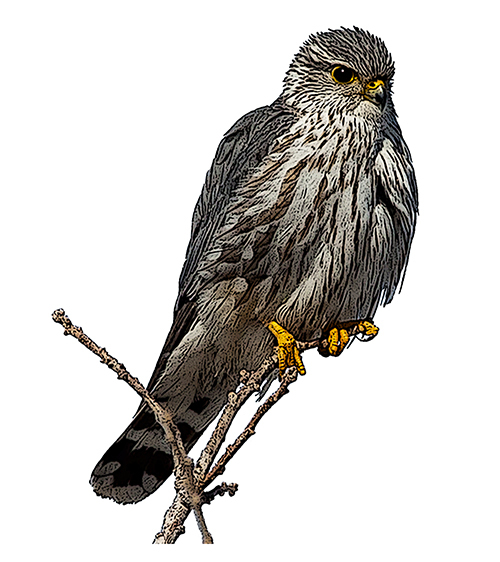 This small but powerful falcon has a large world-wide range, but breeds throughout much of Canada, favouring coniferous forests, grasslands and marine regions. Merlins have grey upperparts, white or pale brown underparts with dark streaks, a barred tail and sharply pointed wings. I am a Canadian expat living in Chicago, IL. Well to be fair, I've also lived in Connecticut, Hong Kong, and other places that I haven't told my coworkers about. I hereby cast my vote for the Merlin or the common Raptor. This bird is my favorite and has personal meaning in my life as I am a die-hard Toronto Raptors fan as well as a Velociraptor maniac! When I was in 2nd grade and we had to pick dinosaurs, my best friend chose the Triceratops because her name is Sarah and I chose the Velociraptor even though I didn't have an anecdote about it. What bird has a white chest, throat, and tail, is used by Canadian falconers and almost NEVER make their own nests? It’s the merlin! I think the merlin should be Canada’s national bird because it has a white chest, throat, and tail which could represent the white on Canada’s flag. They are also known to hunt cooperatively. Plus they are distributed almost everywhere in Canada for hunters. My last reason is, merlins are found almost everywhere in Canada. My first reason that I think the merlin should be Canada’s national bird is because if it’s colours. It has a white chest which could represent the white in Canada’s flag. The second reason is that they can hunt cooperatively similar to the way Canada helps other countries when they need it. This could symbolize Canada’s power when helping other countries. My next reason the merlin should be a symbol of Canada is because they are distributed all around Canada to hunters to track down and kill other birds. This could represent Canada’s power and perseverance when alone. 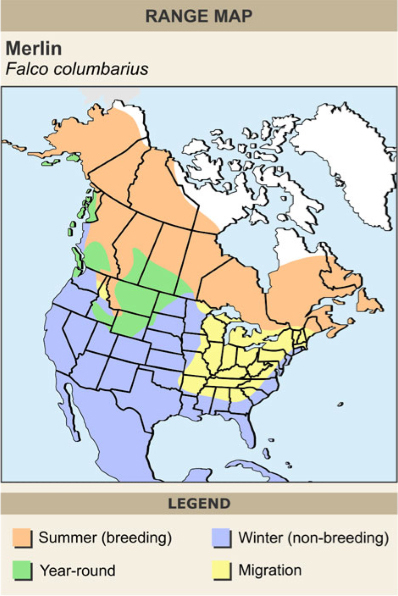 An additional reason is that the merlin would represent Canada is that it is found almost everywhere in Canada. They can adapt to most places in Canada including lakes, bogs, prairies, forests, and a couple more places. Finally, I think that the merlin should be a Canadian bird because of its white/brown colouring, its ability to hunt together, the fact that it is sold to hunters, and the fact that it is adaptable to most places in Canada. Vote Now! Many people in other countries must wonder how we are able to survive the treacherous winter despite the fact that the US gets it worse than us (snow wise) half the time. I have come to the conclusion that it must be because Merlin, the great wizard of old, has been reincarnated in the form of a bird. Merlin works to keep us Canadians strong and free and able to withstand the blistering cold. Merlin uses his magic to make Canada such an accepting and peaceful place. It is obvious that without Merlin we would have given in to the stereotype of living in igloos and riding polar bears to work and school. For the reasons listed above, Merlin should be given the honour of being the national bird. The Merlin has an amazing name, wide range of habitat spread across Canada, is mighty but not flashy and the description of character just seemed to be a good reflection of being Canadian. OK, a shameless plug for sure but none the less you have to admire this stealthy fighter, reminds me as a Canadians in general, not a large population but a fighting spirit all the same, they are very approachable and very skilled. I have spent hours watching Merlins and they deserve to be our National bird. Although the Merlins winter home range includes the prairie Provinces it is growing all the time. It looks as if the Loon has a lock on the vote and a well deserved pick, one still has to admire the Merlin. Darren McKenna is a Below the Elbow amputee who specializes in bird photography, a subject true to his heart since 1968. I think the Merlin is a small yet powerful bird, that reflects the Canadian spirit. It is about as majestic as the Americans have made the eagle up to be, and it is found throughout our country. I have a family of merlins that lives in a tall old snag behind my house every year. They make a heck of a racket when they are hunting, but, all in all, I'm glad my local environment can provide them with fairly decent habitat. Le harfang des neiges est déjà l'emblème du Québec. Les francophones se sont déjà fait dépouiller de plusieurs symboles nationaux dont le castor, la feuille d'érable jusqu''au terme "canadien" qui identifiait à la base les québécois et jusqu'à l'hymne national composé par la Société St-Jean Baptiste. I voted the Merlin because it's really cute and didn't have that many votes. I also think it represents Canada well. I chose the Merlin because they're really cute and didn't have many votes. I also think they represent Canada well. The Merlin is the only species of bird I've ever looked in the eye. He was on my balcony, and he looked right back.